I work with Dr. Allison Okamura in the Collaborative Haptics and Robotics in Medicine (CHARM) Lab at Stanford. This lab's research focuses on the sense of touch in robotics applications relating to the medical field. The specific research projects range from flexible needles for steering to hard to reach places in the body, to magnetically guided catheters for brain interventions, to haptic feedback in surgical teleoperation. Traditionally, high fidelity haptic feedback has relied on world grounded kinesthetic haptic devices. 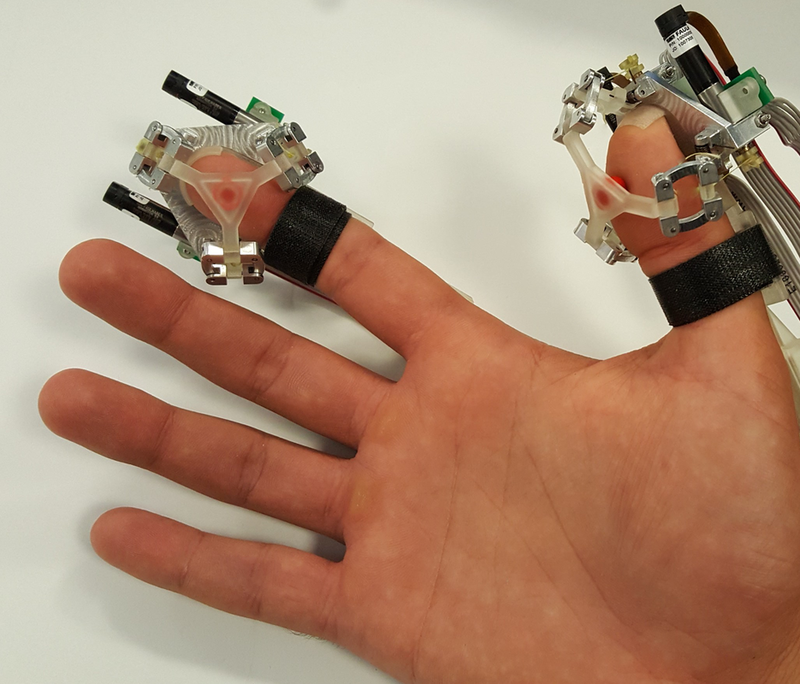 We have developed wearable fingertip devices, capable of moving in 3 degrees of freedom, that can render forces both normally and laterally to the fingerpad. By integrating these devices with virtual reality environments, we can create an extremely authentic sense of object manipulation. 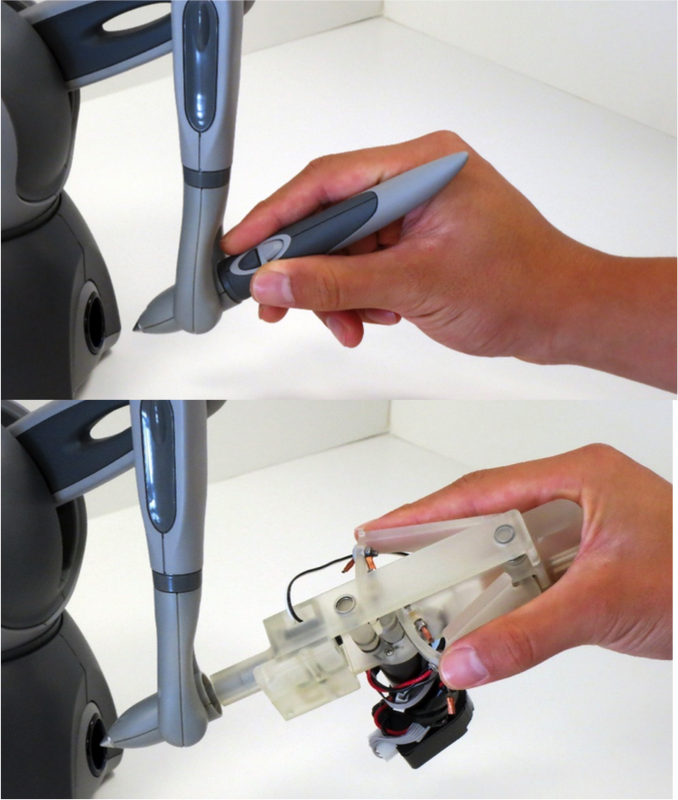 Despite improving user task performance in some teleoperated tasks, haptic feedback is not incorporated in clinical surgical robotic systems due to stability and safety concerns. Researchers have attempted to convey this force information through other sensory channels in a technique called Sensory Substitution. During everyday manipulation tasks, skin stretch feedback is present and contributes to your perception of interaction forces. We hypothesize that skin stretch feedback could be a more intuitive feedback modality to replace force feedback when compared with other current sensory substitution methods such as vision and audio feedback. Through a series of psychophysical experiments, we characterize users' ability to discriminate between surfaces of different stiffness using skin stretch feedback and compare their performance against that obtained using force feedback. 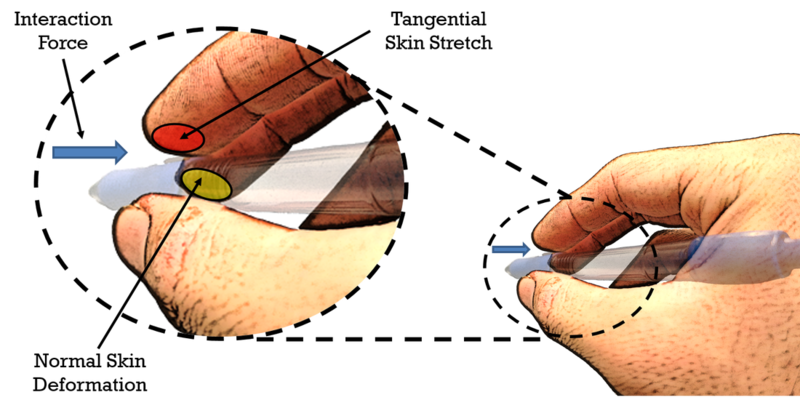 It is hypothesized that by imposing artificial skin stretch cues, we can increase the perception of stiffness perceived by a user. Such a sensory augmentation scheme will prove useful in situations in which force feedback is hard or impossible to achieve, including surgical teleoperation in which force feedback gain has to be tuned low in order to achieve stability and safety. Other situations call for higher forces to be rendered than actuators are capable of achieving. In these scenarios, skin stretch feedback could help increase the range of applications of under-powered actuators. The Phantom Omni is a common, affordable haptic device used in a number of labs throughout the world. Though it provides 6-DoF information (3 position and 3 orientation degrees of freedom), it does not provide an intuitive way for teleoperating 7-DoF systems that have a gripper. 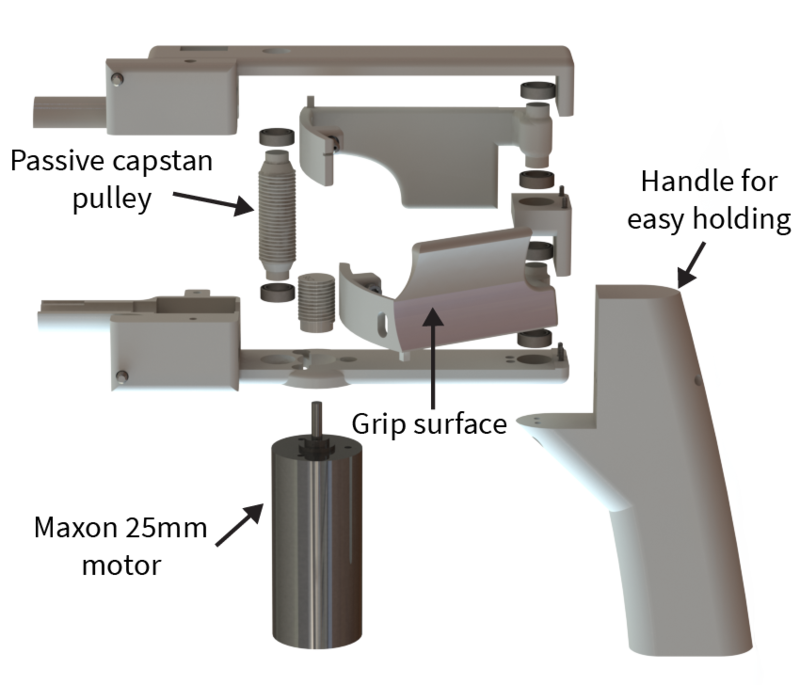 For use with experiments on the Raven II surgical research platform, we developed a gripper that interfaces through the stylus attachment of the Phantom Omni. This gripper provides grip position information the Raven II and can also relay force feedback through its DC-motor. 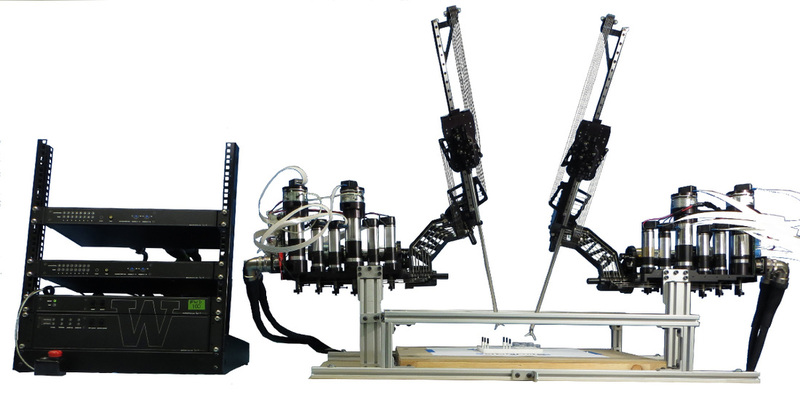 We implemented a novel double capstan mechanism that can drive both arms of the gripper open using only one motor. Additionally, rather than run wires to a DAQ on the computer, we used a microcontroller on the gripper to send PWM signals through the headphone jack of the Omni, communicating the current grip angle. One of my future research interests is the way that multiple people share control and information when teleoperating a collaborative system. In many situations, such as during robotic surgery surgeon training, it is desirable to have multiple users share control of a teleoperated system to learn from each other's actions. In other situations, we would like to automate certain actions and convey the autonomous intent to the user. We are actively research paradigms for relaying force and tactile information to the users of such systems.